A raging wildfire in Northern California has forced the 27,000 residents of the city of Paradise to flee. Dramatic footage shows flames closing in around the highways out of town and thick smoke hanging in the sky, obscuring the horizon. 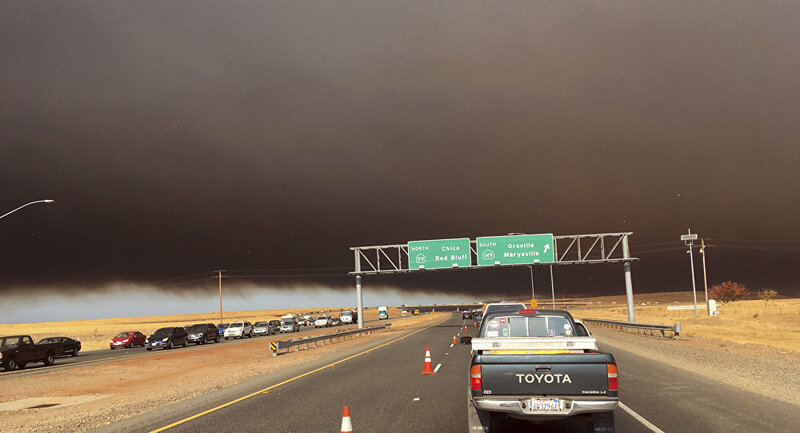 Butte County Sheriff Kory Honea called it a "very dangerous and serious situation," AP reports, and noted that some residents have been forced to abandon their vehicles to escape the conflagration. ​Paradise sits in the foothills of the Sierra Nevada mountain range, near the larger town of Chico and about 75 miles north of the state capital of Sacramento. However, on Thursday the place is very far from paradise: a rapidly growing wildfire encompassing 6,000 acres is closing in on the town, forcing its residents to drop everything and evacuate, the San Francisco Chronicle reported. ​Residents fleeing their town recorded dramatic footage capturing the anxiety of their situation and the horror of the raging inferno consuming the world they knew. As such, many of the videos included here contain graphic language. ​Cal Fire, the state's agency responsible for managing the region's chronic wildfires, reported that the blaze has been dubbed the "Camp Fire," a humorously serendipitous name that comes from it place of origin: the area of Camp Creek Road and Pulga Road near Highway 70 in the Feather River Canyon, to the east of town. At least one young resident was confused by the name. ​California Highway Patrol announced Thursday afternoon it had closed several roads in the area, including Skyway Road, which is the northerly passage out of town, and Highway 70 to the south of the fire. The smoke of the rapidly growing blaze could be seen for miles. This video was shot on Highway 99, several miles to the southwest of Paradise. ​Honea says resources are spread thin, but officials are "doing everything we can to get people out of the affected areas."